When the weather starts to warm and we start thinking about what to eat with the lovely greens and herbs that are just starting to take off, we turn to a farm favorite: a chilled wheat berry salad. It’s acid bright and sweet and cold and is just the thing to get us geared up for the hot days to come. Drain and rinse the cooked wheat berries. Combine the dressing ingredients (oil, vinegar, honey, salt and pepper) and toss well with the wheat berries. Cover and refrigerate for 20 minutes to an hour. 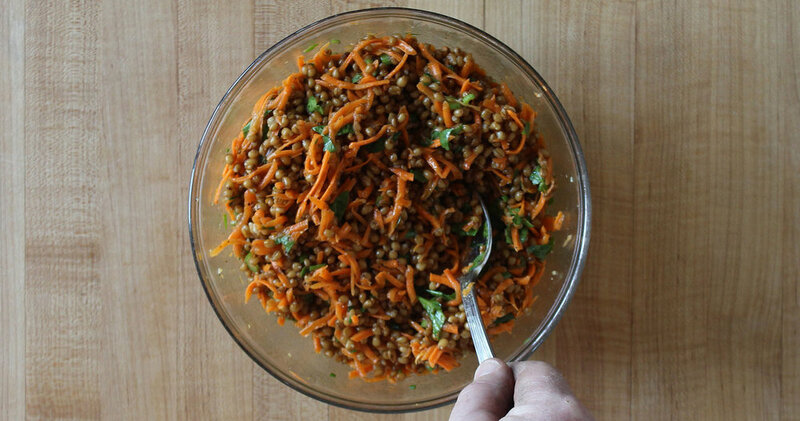 After the wheat berries are chilled, add the carrots and chopped herbs and combine. Adjust seasoning to taste.